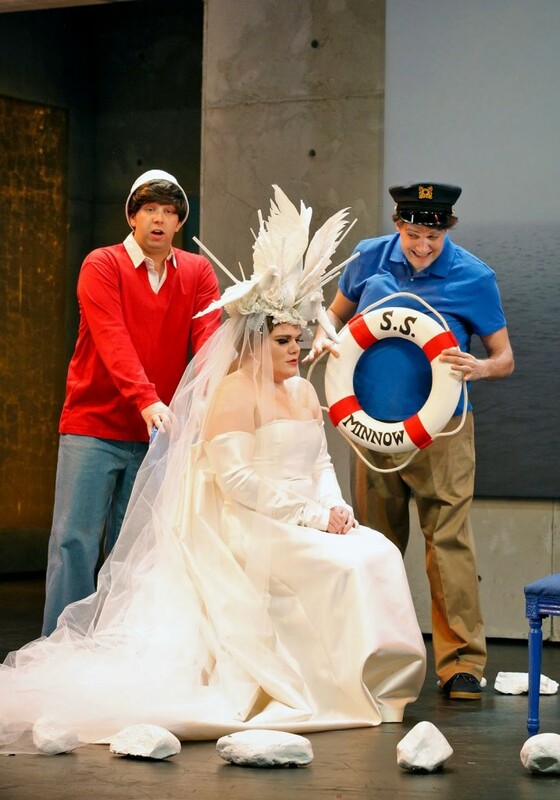 Prepare yourselves, for Curtis Opera has given us the Gilligan’s Island-themed Ariadne auf Naxos we’ve all been waiting for. But while that might be this production’s most memorable feature–we always have a tendency to identify productions by a signature, the [opera] with the [gimmick], like “the Così with the hippies” or “the Bohème with the UFO”–it’s hardly the production’s only feature. 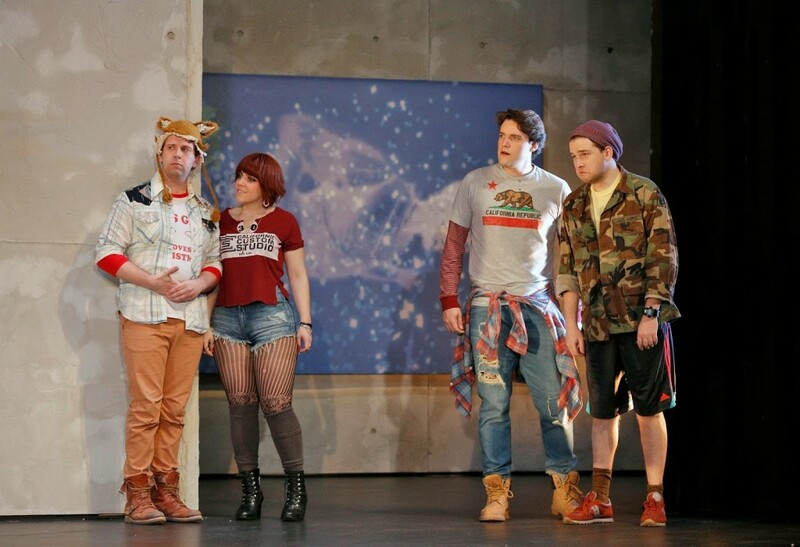 This is a co-production between Opera Philadelphia and Curtis, but the performers are Curtis students (with one alum, no prizes for guessing which role). 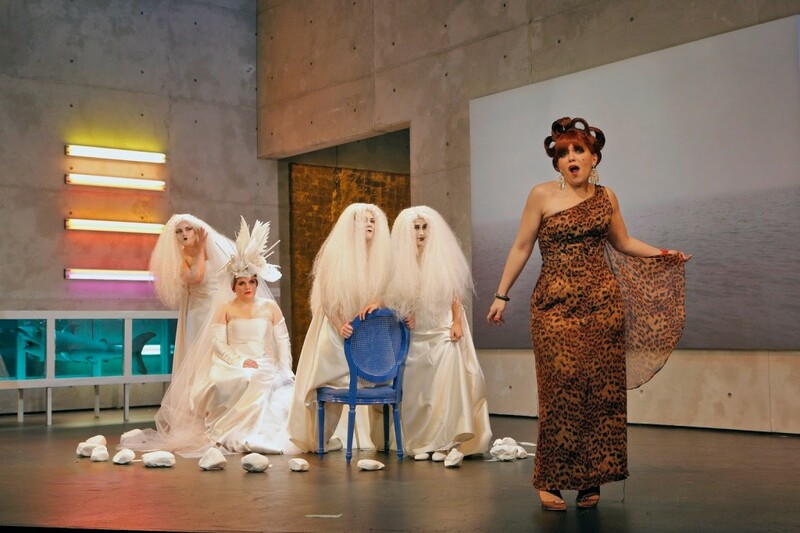 The 600-seat Perelman Theater is an ideal space for this opera and for these singers. Like most Curtis productions, the performers are enthusiastic and all at different points in their development. And, like most Curtis productions, it’s inventive and more than the sum of its parts. Strauss/Hofmannsthal, Ariadne auf Naxos. 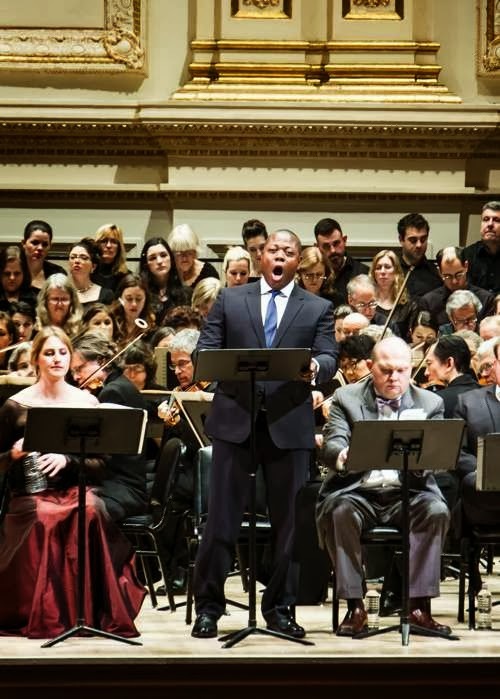 Opera Philadelphia and Curtis Opera co-production, 3/4/15. Production directed by Chas Rader Schieber, sets by David Zinn, cosumes by Jacob Climer, lights by Mike Inwood, conducted by George Manahan with Heather Stebbins (Ariadne), Ashley Milanese (Zerbinetta), Kevin Ray (Bacchus), Lauren Eberwein (Composer). Let’s start with the production first. The prologue is set in a Brutalist bunker of some modern one-percent Richest Man (sets are by David Zinn). The Composer is an earnest prepster while the comedians are relaxed Californian types. While the setting is contemporary, nothing is really updated–this is a text which is colloquial enough that it doesn’t have to be and the modern dress fits in very well. It’s a shame that the very concise surtitles leave out many of the funniest lines (and sometimes they just don’t make sense–why change the desert island to just a desert?). It’s also laid-back and almost naturalistic in style, without being slow–or at least it is less cartoonish than one often sees (a few moments such as Bacchus’s wig excepted). This works well in the small theater. Considering what we know about the Richest Man, it’s quite fitting that the opera should take place among a vaguely sea-themed collection of pricey modern art (a Damien Hirst-esque shark and golden skull, an ocean photograph, some neon art). Ariadne is surrounded by a circle of stones. The opera seria people, including the nymphs and Bacchus, are all in white, while the comedy crew eventually roll/walks in, Flintstones style, in the Professor’s bamboo car. Personally, I’ve always hoped for a Lost or Survivor Ariadne, but Gilligan’s Island is more visually distinctive and, well, probably fits the opera audience demographic more closely (even though it aired well before the entire cast–or I–was born). My careful internet research (=Google) suggests that Zerbinetta is Ginger, Harlequin is Gilligan, and the other comedy guys are Thurston Howell III, the Skipper, and the Professor. It’s a pretty good, entertaining frame for the piece, contrasting the arty (but, of course, extremely commodified) world of high and modern art with the world of TV. It was obvious that this audience is more on the side of TV. I don’t think I needed this production to figure that out. But the uproarious response to the references brings out the juxtaposition of comedy and tragedy in unusually direct, vivid fashion. The two sides also interact more than in many productions–particularly the nymphs. The ending is a more difficult matter. To be fair, no one knows what to do with this: Bacchus arrives and is transformed, Ariadne is transformed, there is talk of a “love cave,” they both sing about this very loudly (personally I love this incredibly garish music but it is a difficult thing to deal with in context) and at length but it’s unclear if there is any way to depict transformation visually. It’s not Daphne. I’ve seen it staged straight, straight again, ironically, and as high kitsch, and, yeah, it’s always still a puzzle. 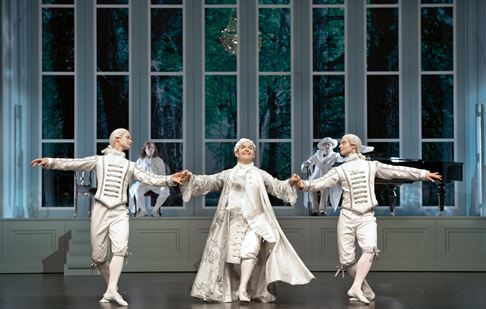 This production puts Bacchus in the white clothes of the seria characters, and the effect is rather of an elderly cult leader finding his new acolyte. I’m not sure if that’s really where we want to go. Now for the singing: honestly, I’m not quite sure of the best approach–this is presented by Opera Philadelphia and the students are all extremely talented, but they are students and there are some things they haven’t quite mastered yet. The most complete performances in the cast were given by Lauren Eberwein as the Composer and Ashley Milanese as Zerbinetta. Eberwein has a full, slightly dark mezzo which is just the right color for Strauss, and she has no problem with the high notes. She ripped through the role with unwavering committment and enthusiasm. The soft parts weren’t as easy as the loud parts and her German could be better, but it was an exciting performance. Milanese is also exciting, and already has the technique to sing a very accomplished Zerbinetta. Her voice is light but not thin, the coloratura is good, and her only real hurdle is a spotty trill. Acting-wise, she was likeable and effective without quite putting together all the pieces into a full character. 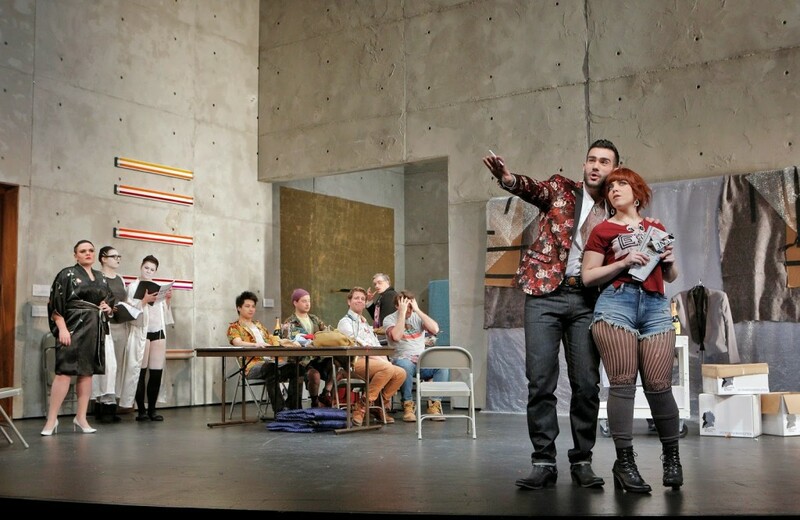 As Ariadne, Heather Stebbins has a big, bright, cutting voice. She’s also a convincing, specific actress, was touching in her opening scenes, and did all the heavy lifting in the finale. But her ideas weren’t always coming through in her singing, which lacked a degree of finesse and control. She is definitely a talent to watch, however. 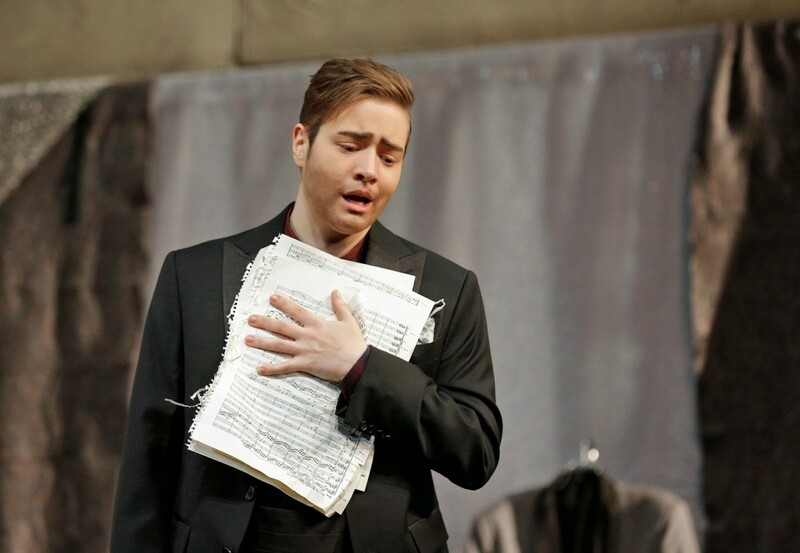 Class of 2012 tenor Kevin Ray sang Bacchus, and he got through the part with somewhat leathery, unvarying tone. (Why do so few Bacchuses react to their own transformations, by the way?) In smaller roles, Johnathan McCullough was an agreeable Harlequin, Dogukan Kuran a good Wigmaker, and the three nymphs had serious blending problems. As the Major-Domo, Dennis Chmelensky had extremely good German (he may BE German? not sure). One disappointment was the orchestra, under George Manahan. This is hardly ever a problem for Curtis but the prelude and prologue showed some rhythmic uncertainty and ensemble issues. The second half was better, and some of the solo playing was outstanding. Still, I highly recommend this opportunity to see a fun production in a small theater. The production runs through Sunday; it is sold out but returns may be available. Postscript, 3/9: I read this Inquirer review with interest (and only after I wrote the above). I think I understand the criticism that the cultural references are too specific, but it’s not something that occurred to me at all because, well, I’m not so tuned in with Gilligan’s Island. It took some research for me to figure out how specific they were. I am kind of amused, however, that the newspaper’s high art critic is so much more receptive to high art references (Hirst, Richter) than low culture ones (TV). I am sorry not to blog; I have been facing major academic deadlines and decisions every day. When I finish working, I have found myself too spent to consider writing something else. But I saw Arabella at the Met last Friday, and I have thoughts. I enjoy this opera a lot, probably more than it strictly merits. The beatific parts like the Act 1 soprano duet, Act 2 love duet, and last five minutes are, for a Strauss fan, just so good in their extraordinary concentration of what we love about Strauss opera. And even the talkier passages are enlivened with brilliant orchestral details. 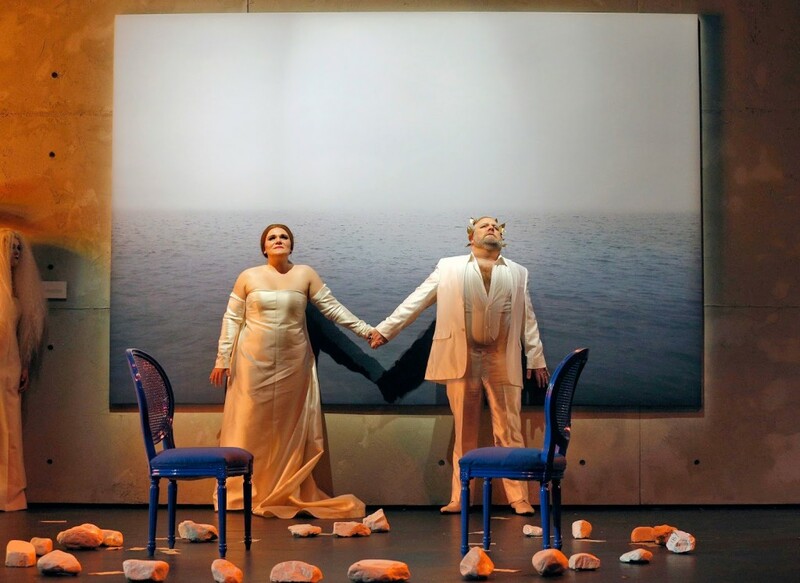 Hofmannsthal’s libretto is an interesting, subtle allegory of Gründerzeit Austro-Hungarian politics (Austrian Arabella needs to reconcile with Mandryka, the uncouth East). This is something that almost no one seems to notice–probably because it tends to be concealed by the color and expressive directness of Strauss’s music. But I’ll stop. As may be obvious, I’ve “worked on” this piece (as academics say), and you can read that essay later (it isn’t out yet). This Met revival is, alas, not a particularly good Arabella. 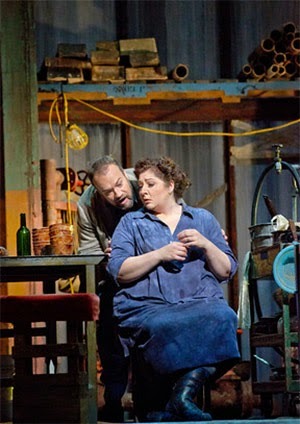 It has the odd misfortune to get the single most difficult role unusually right–that would be Michael Volle’s excellent Mandryka–and have issues in the comparatively easy lyric soprano department. Word was that this revival was originally scheduled for the phenomenal Anja Harteros, who withdrew a while ago. Her replacement in the title role, Swedish soprano Malin Byström, was new to me. She certainly has a lovely, warm tone, and the voice is very big in the middle. But her registers are unbalanced, and the warmth stopped around the F sharp at the top of the staff. 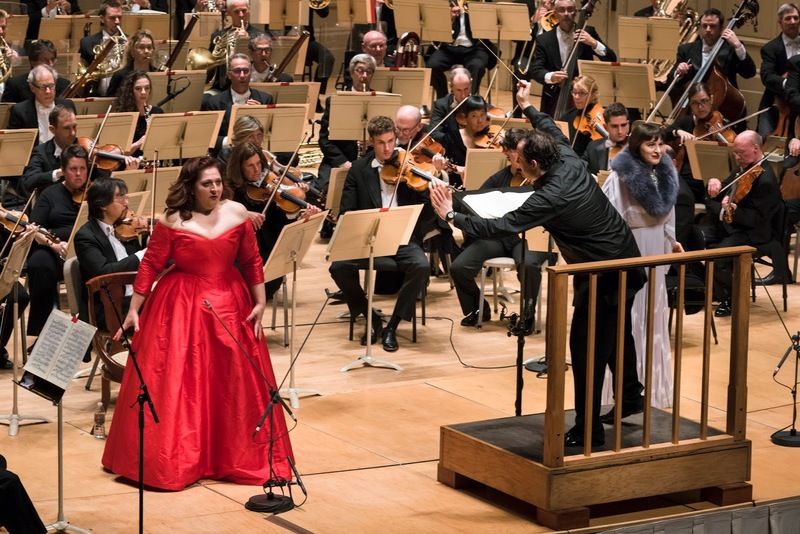 Alas, Arabella is a role that really depends on easy, beautiful high notes at the big moments, and there Byström suddenly sounded insecure and thin. She is a decent but generic actress, lacking a certain glamor and vulnerability to bring this part off (my friend thought she was matronly–she certainly didn’t seem like the flirt Zdenka calls her). She didn’t have much help from the pit or rest of the cast. Philippe Auguin’s busy conducting had little sense of the work’s flow, nor did those beatific bits glow as they should. Juliane Banse was a later replacement as Zdenka, and was unhappily cast. I’ve enjoyed her singing in other roles, but honestly her Zdenka days are past her by a decade or so. Her grainy, dark, smallish voice sounded labored, particularly in the higher ranges, which have to be even sweeter and easier than Arabella’s. This is not a difficult role to cast and I wonder why the Met could not locate someone more suitable, even on short notice. Roberto Saccà similarly sounded underpowered and worn as Matteo. He was nearly sung off the stage by Brian Jagde as third-in-line suitor Elemer. Jagde is a powerful Heldentenor-in-training. 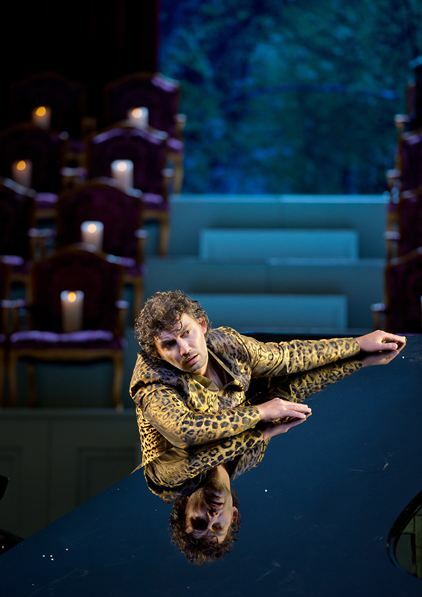 I’m not sure if he could sing Matteo–it’s rather high–but I certainly would like to hear him in something where he has more to do. The other supporting roles such as Adelaide, the Fortune Teller, and Waldner were uniformly poorly sung. One suspects that all the good Arabella supporting players are in Salzburg at present. I feel sorry for anyone who is obliged to sing chirpy Fiakermilli, but I still should report that Audrey Luna sounded very nasal. The main redeeming singer, however, was Michael Volle as Mandryka. This is an awfully difficult role and almost no one sings it well. (I say this having seen the opera a few times and having seen every Arabella DVD in print and several that aren’t in print. See above, academic work.) Volle does it with ease and character, a solid warm tone and good diction. He’s a bit too comic for my taste–his Mandryka is very much a bumbling, fumbling bumpkin–and reads on the older side (he’s not Bernd Weikl in the Schenk TV movie), but he gives the character texture and life, and his singing has real dignity. The Otto Schenk production can perhaps be blamed for the dramatic blandness. 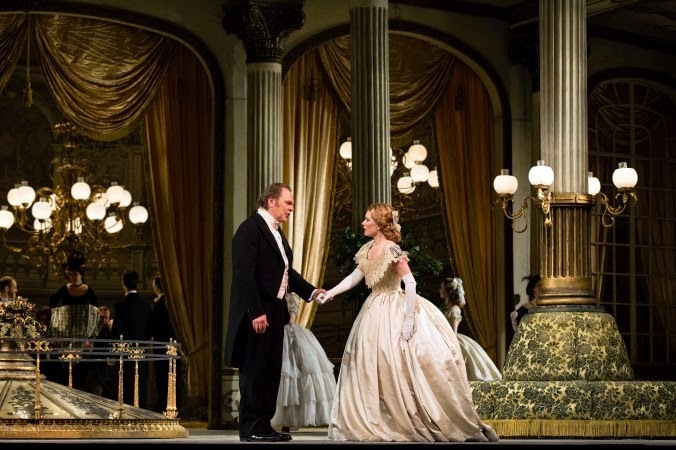 Productions of this opera tend to tilt towards Strauss’s opulence rather than Hofmannsthal’s grit, and this one is no exception. If the Waldners are so broke, I would suggest to them that they still have a lot of knickknacks they could put in hock. The staging of Act 3 in particular is cluttered and over-busy. (I also think this act also benefits from some cuts–I think this might have been the least-cut Arabella Act 3 I’ve seen.) When a lighting gel fluttered down from the flies during Arabella and Mandryka’s love duet, it would have been a Verfremdungeffekt if we were in certain German opera houses, but here it really wasn’t. 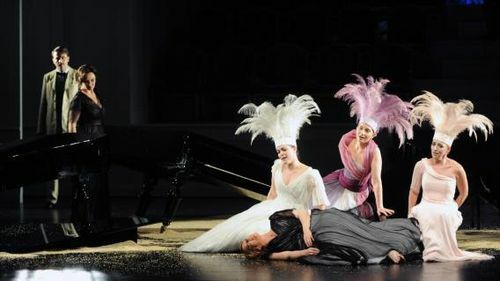 I don’t think I’ve yet seen a fully convincing production of this opera, one which balances the alternating enchantment and motor-like energy of the music with the hardheaded, operetta-like libretto–is it too foolishly optimistic to suggest that the Met try to come up with one should they produce it again? 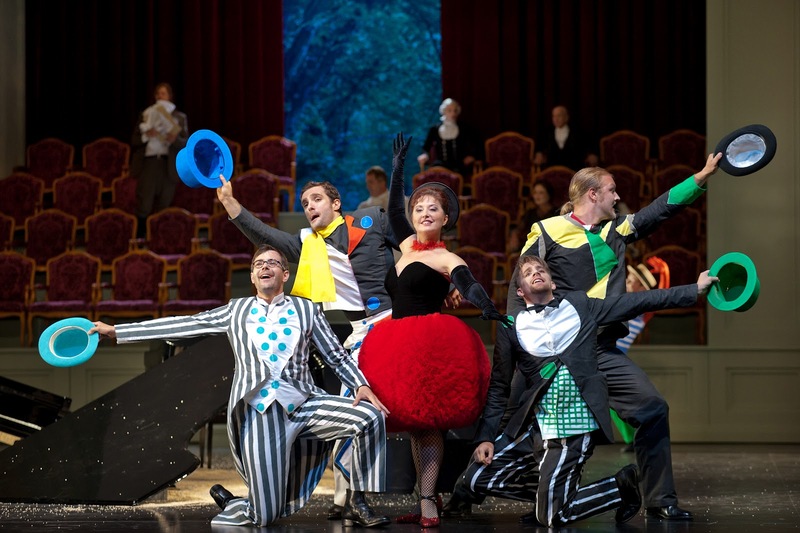 Or to some other opera house: has the often-underrated Claus Guth directed this one yet? He has a real eye for this period, and for the thin line between fantasy and reality. I think he might be your guy. I also have thoughts about Platée from the other week. More precisely, I want to write about Simone Kermes, because she is something else. Maybe soon! Strauss, Arabella. Metropolitan Opera, 4/11/14. Feuersnot is like the Richard Strauss of the tone poems invading the opera house. It’s his second opera, from 1901, a short exercise in post-Wagnerian nose-thumbing that is more a series of picaresque adventures than a grand coherent drama. But it’s got some fun music and I’m glad that the American Symphony Orchestra dusted it off at Carnegie Hall on Sunday. The plot would seem to offer a real playground for a creative director, though this presentation was in concert. On Midsummer’s Eve in medieval Munich, the sorcerer Kunrad is spurned (and mocked) by Dietmut, the maidenly object of his affection. In return, he extinguishes all of the town’s fires (“Feuersnot”–want of fire). Dietmut is persuaded to change her mind and her deflowering provides the most lyrical Straussian music of the opera (orchestral–but rather calmer than the Rosenkavalier prelude). That doesn’t sound like much of a plot but there’s some congenial local color of Bavarian drinking songs and local citizenry and such, and a bit of backstory too–Kunrad (AKA Strauss) is taking the place of a departed, older sorcerer (identified musically as Wagner) and is trying to figure out a new way of going about things. The story amounts to a parody of Wagnerian metaphysics: a Tristan love duet parody complete with Stabreims just before Kunrad is left hanging midair in a basket (I tell you, a staging of this opera would be a good time) and, in the finale, a redemption by love that is abrupt and really more like a redemption by lust. 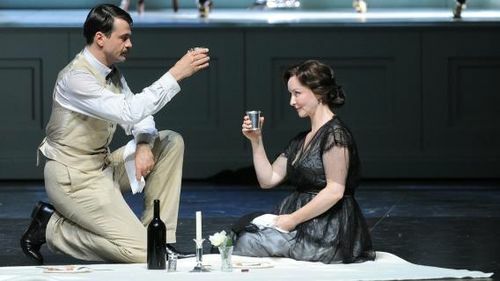 Strauss–and, even more importantly, librettist Ernst von Wolzogen–seem to suggest the emptiness of these idealistic Romantic gestures. It’s unclear what their replacement would be—I guess you have to wait for Salome for that—but in one act of around 95 minutes, Feuersnot does not wear out its welcome. This early twentieth-century satire is such a perfect fit for Leon Botstein that it’s kind of surprising he hadn’t conducted it long ago. He pretty much kept it together: it’s an uneven score but some of the loud bits are rousing and the love scene has authentic Straussian Schwung. The Singspiel-like bits that portray Old München are less interesting. Most impressive in this performance was the Manhattan Girls Chorus, whose part in the score was long and complex (often involving what I presume were either old Bavarian folk songs or verses intended to sound as such). The Collegiate Chorale was also excellent. While Strauss is, I think, criticizing much of Wagner, he did seem to enjoy writing Meistersinger-like crowd scenes, too. The soloists were also very good. As Dietmut, Jacquelyn Wagner’s even, clear soprano is ideally suited to Strauss, and her high notes were particularly strong. This can’t be an easy role and she was consistent and rock-solid throughout. As Kunrad, Alfred Walker projected well with a bass-like sound (he’s credited as a bass-baritone) that sounds like it could be impressive in Wagner, though his monologue could have benefitted from a little more variety that’s also Strauss’s fault. There are a ton of supporting roles, none of whom are given a terribly distinct musical profile (as the army of Rosenkavalier supporters are, for instance). Dietmut has a trio of Rhinemaiden-like friends and most of the professions of München are represented. Most of the singers were on point if not particularly memorable, two exceptions were Branch Field’s gruff Innkeeper and Clay Hilley’s large-voiced Baliff (given the magnificent name of Schweiker von Gundelfingen). Despite a note proclaiming that Bavarian dialect would be in use, it mostly sounded like Hochdeutsch to me. It’s not a masterpiece, but it’s an amusing work that I was glad to hear. Strauss, Feuersnot. American Symphony Orchestra at Carnegie Hall, 12/15/13. 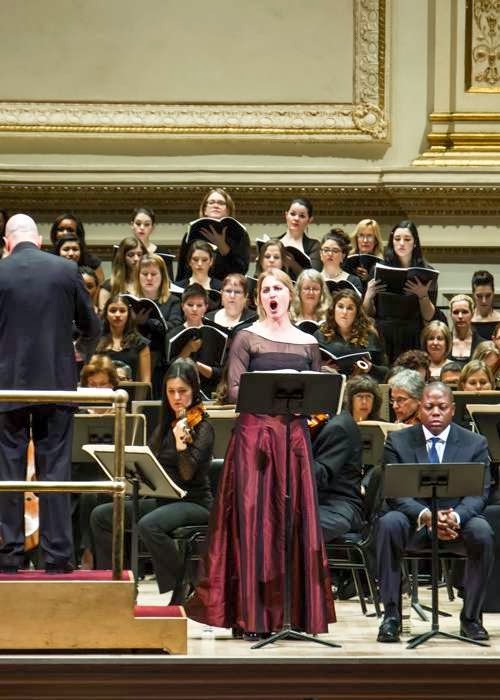 Conducted by Leon Botstein with the Collegiate Chorale, Manhattan Girls Chorus, and many soloists. Any sighting of the big and complicated Die Frau ohne Schatten at an opera house is an event. Strauss’s score is one of his most varied and exciting and unique (it’s not violent like Salome or Elektra, but nor is it hyper-romantic like Rosenkavalier or Arabella). The libretto is, shall we say, obscure, mixing spirits and mortals, symbols and talismans like a Zauberflöte without the proverbs, and even less logic. Where Die Frau ohne Schatten excels is majesty. This musically distinguished and beautifully designed Met revival captures that magic, and is definitely one of the must-sees of the fall season. Strauss, Die Frau ohne Schatten. Met Opera, 11/12/13. 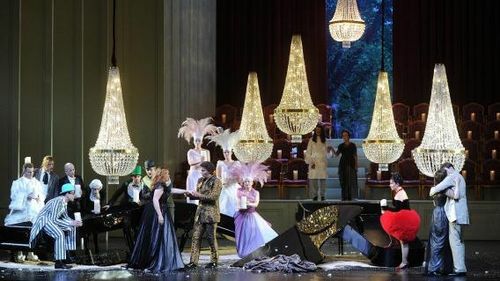 Production by Herbert Wernicke, conducted by Vladimir Jurowski with Anne Schwanewilms (Empress), Ildikó Komlósi (Nurse), Christine Goerge (Dyer’s Wife), Johan Reuter (Barak), Torsten Kerl (Emperor), Richard Paul Fink (Messenger), Jennifer Check (Falcon). Before this performance, I read Hugo von Hofmannsthal’s novella version of the story. It’s a beautifully written story and clears up some of the more immediate confusions of the libretto. But on the larger issues I can’t say I’m that much more enlightened. (It’s only available in German, unfortunately.) The story is about a spirit brought into the world of humans by marriage to the Emperor–thus she is made the Empress. To remain in the human world, she needs to acquire a shadow (also meaning become pregnant). Her Nurse decides to manipulate a poor dyer’s wife out of her shadow and thus fertility. This does not go too well. The clearest message that can be extracted from the libretto—that the Empress and Dyer’s Wife need to stop thinking so much about themselves all the time and realize their essential function as baby-making factories—is, um, not my favorite conclusion in all of opera. (It, as well as the novella’s obsession with food, probably have something to do with the time of the opera’s composition right after World War I, though it was begun before that.) 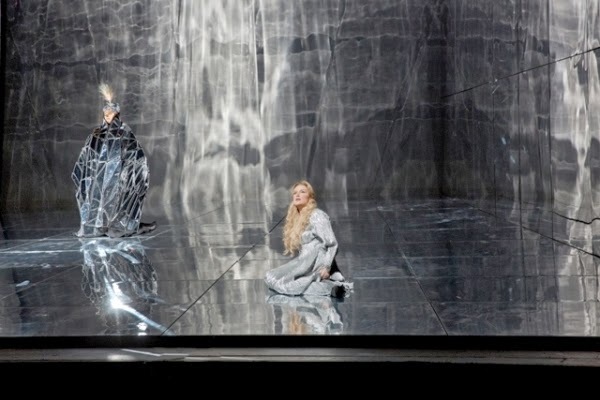 While the music seems to make it all make glittering sense, productions of Frau have struggled to find a visual realization for the spectacular and causally confusing events, e.g. the earthquake at the end of Act 2, the Fountain of Life, and even the titular shadow. 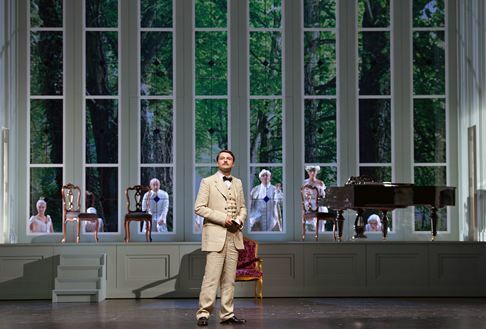 The last production I saw, Christoph Loy’s in Salzburg, threw in the towel entirely and put the whole thing in a recording studio (weak sauce). 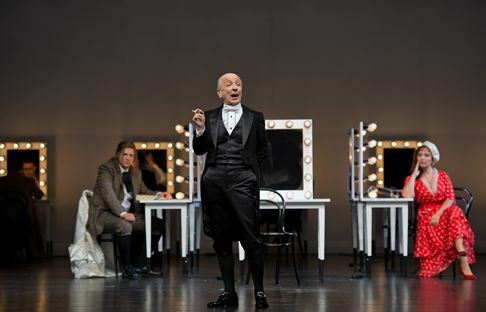 On that front, Herbert Wernicke’s Met production is a great success, and actually lives up to the music’s energy and atmosphere. First performed in 2001, it’s being revived for the first second time and first since 2003. Wernicke died at a tragically young age in 2002, and the direction here is credited to J. Knighten Smit. The design—all by Wernicke—is the primary attraction. 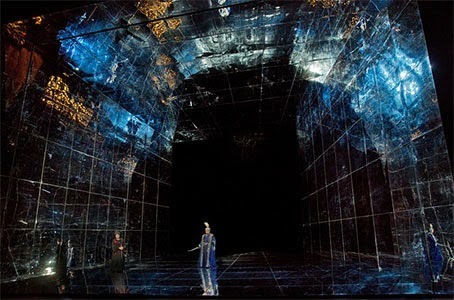 The world of the Empress, Emperor, and Nurse is a mirrored box, whose transformations are seen in various dramatic flickering lighting effects. 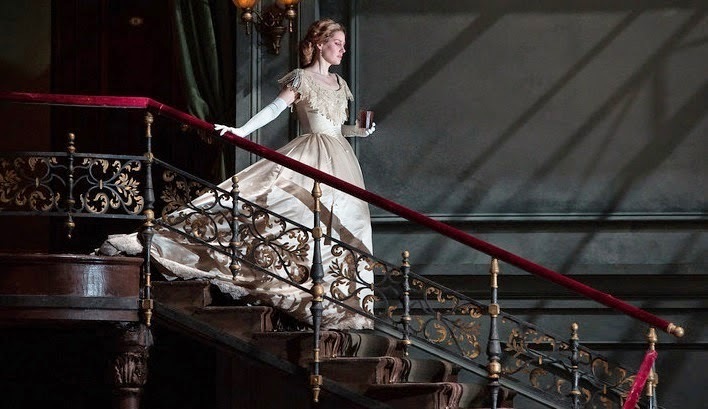 In contrast to this glamour, the Dyer’s house is in a gritty sewer or subway, located below the box and connected by a fire escape staircase (one of the best uses of the Met’s scenic elevator I’ve seen). The upper level is timeless and mythic, the lower contemporary and realistic (Act 1 ends with the dyer Barak poignantly staring into an open refrigerator). The implication is vaguely Marxist: the Empress (surrounded by narcissistic mirrors) is exploiting the literal underclass, for whom she gradually learns compassion. 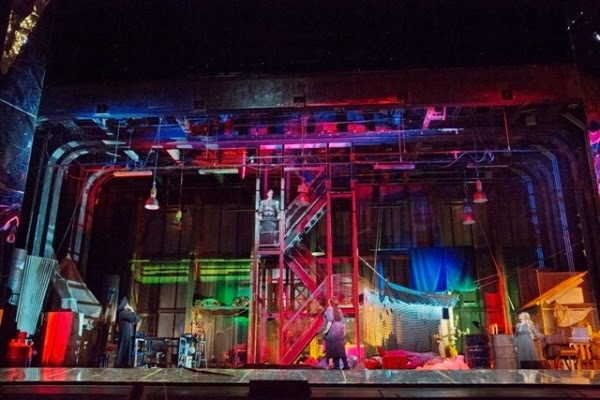 The finale is Brechtian–or lieto fine-ian—with the lighting scaffold descending to reveal the stage mechanism and the singers addressing the audience directly. Since the music does not follow suit in any way, I found this gesture a little ineffective, but overall this is a very strong and convincing production. The larger problem was the distinct lack of direction of the singers. The images are strong enough that I trust Wernicke’s vision remained at least partially intact, but it would have been a lot more engaging and stronger with less park and bark. The singers seemed left to their own devices, with varying and dissonant results. Anne Schwanewilms was a blank, impassive Empress, intentionally so, and her slim, cutting soprano also sounds otherworldly. It’s a very German sort of sound, somewhat squeezed and instrumental. The highest notes were difficult for her, and her enunciation of the words was not very clear, particularly for a native speaker. Overall, I found her performance of this role in Salzburg a few years ago more satisfying. The other singers were less notable, though all were pretty good. Ildikó Komlósi sounded worn and shrill as the Nurse, but this role is not exactly a walk in the park. Torsten Kerl coped with the high-lying role of the Emperor capably and reasonably musically (he repeatedly gets the opera’s One Big Tune, representing his and the Empress’s first encounter and the choice of the postshow subway sax/flute player), but did nothing resembling acting and his voice sounds a little on the small side. Johan Reuter made a very human Barak, but also a very lyrical one, and was not ideally audible. Richard Paul Fink as the Spirit Messenger was rather better on the volume front, and countertenor (!) Andrey Nemzer was alarmingly loud as the other messenger. The Young Man and the Falcon were both amplified, and sounded quite artificial. Of course the orchestra is one of the main stars of any Frau, so I’m sorry to have arrived here last. Vladimir Jurowski conducted a beautifully delineated, controlled, very vertical account of the score. I heard lots of details and the singers were only occasionally drowned out. He is restrained, saving the full Straussian power for a few big moments. I kind of wish he were less parsimonious? It was a very beautiful and elegant reading, but Strauss is not a composer who thrives on frugality, and I would have appreciated a bit more sonic extravagance. (Caveat: I was in the damn rear orchestra again, where acoustics are bad. If i didn’t have so much work, I’d go again and sit in the Family Circle.) I also missed the momentum of Christian Thielemann’s Salzburg rendition, which I preferred by a small margin. But this is nonetheless a musically distinguished and scenically remarkable production; go see it. I went to hear Elina Garanca’s New York recital debut on Saturday and I wrote about it for Bachtrack. singer rather than an effective communicator. You can read the rest here. For all I know Elina Garanca is the nicest, warmest person in the universe, but she still has trouble portraying humanity onstage. This recital was very well-prepared and she really was trying, but the effort was all too obvious. 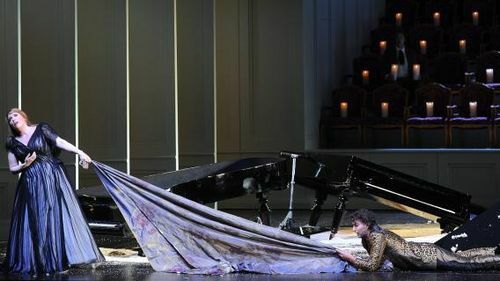 I’ll be going to Giulio Cesare at the Met at the end of this week.